So, this is my serger. 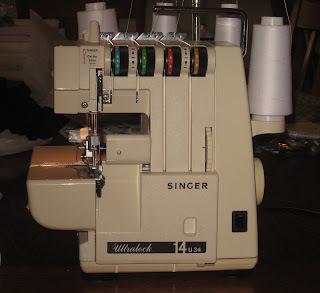 A Singer 14U 34. I acquired it, used, about a year ago from a friend for $50.00. I was so excited to get it. I have only used a serger a few times and am not familiar with the treading, so it took some fooling around with until I was ready to serge Mom's skirt. Right now I only have white cone thread, so I can only serge something white, or something that goes with white. Mom's skirt was perfect for this. I am pleased with how it works, so I will have to invest in some other colored threads.